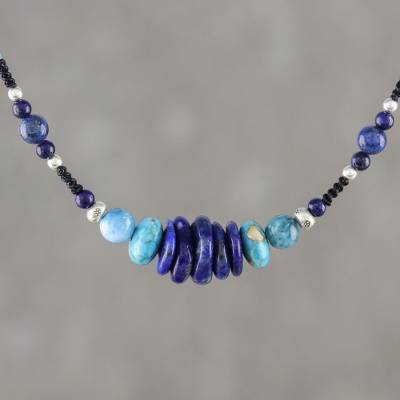 Lapis Lazuli and Apatite Beaded Necklace from Thailand, "Water Lover"
With a cool, watery vibe, blue discs of lapis lazuli, apatite, and reconstitued turquoise center this necklace from Thailand, flanked by round beads of lapis lazuli and long beaded strands of turquoise. Thai artisan Sareeyakarn designs the necklace, dotted with petite beads of silver that are crafted by Karen hill tribe silversmiths. This accessory adorns the wearer on knotted cord, closing with a silver clasp. You can find lapis lazuli and apatite beaded necklace 'Water Lover' by Sareeyakarn in jewelry categories such as Hill Tribe Necklaces, Birthstone Necklaces, Gemstone Necklaces, Bohemian Necklaces, Turquoise Necklaces, Reconstituted Turquoise Necklaces, Lapis Lazuli Necklaces, Apatite Necklaces, Multigem Necklaces, Silver Necklaces, Fine Silver Necklaces, Polyester Necklaces, Beaded Necklaces and Pendant Necklaces. Enjoy exploring these sections for other Novica treasures. Sareeyakarn has been a single mother for four years. She supports her two children. Being a Novica artisan means many things to Sareeyakarn. She is able to sell her work without the expense of a store. Her schedule is flexible, enabling her to care for her parents and her two children. She is thankful for the income that her Novica sales bring in. It is the family's only source of income and it brings stability to her home. She hopes to grow her Novica sales and is constantly working on new designs. Sareeyakarn has received 4 microcredit loans with 0% interest from Kiva and Novica, the first for $800 and the most recent for $2850. Sareeyakarn is a single mother who supports her two children and provides for their education. This necklace is beautiful! Just the right length. Colors and arrangement stunning. I will reach for this necklace often! "Nature inspires most of my designs. I love the simplicity and colors of nature, whether seen in flowers, leaves, butterflies, birds and the sky at different times." "My name is Sareeyakarn but my friends call me Fai. "I was born and raised in Lampang, where my father was a farmer and my mom made clothes. I liked to go to the rice fields with my father. I loved its atmosphere and the beauty of nature. There were all kinds of colors and patterns in the leaves, grass, feathers, butterflies — everything had its own details and was beautiful. "When I was young, my uncle was my inspiration. He loves art and drawing. He likes to take scrap wood to make into interesting objects. When I was in first grade, he gave me a ballpoint pen to draw anything until the color became darker. Then he took my drawing and pasted it on the back of a jeans jacket, as a background. After that, he used a pen to draw an old movie poster without erasing anything. This was all so amazing for a little girl like me. He inspired me to do the same things that he did. I kept learning and doing by myself. "Then I started entering art contests. I was excited when I won an award and I was encouraged to continue with my artwork. One of the awards I was most proud of was third prize for the invention of anything from natural materials when I was in primary school. These awards were sponsored by Princess Maha Chakri Sirindhorn, the King's second daughter. I created a doll from rice straw. "My life began to change when I went on to high school. I had to study very hard because there was a lot of competition among the students, so I began to look away from art. When I finished high school, I passed the examination and qualified to study medical technology. The university is in Bangkok, so I had to move there. The workload was intense. I had to study even harder and grew further from art. "After graduation, I took a job in a hospital laboratory. During that time, I continued my dream of working with art as a hobby, although I didn't make any income from it. When the economic crisis called 'Bubble Economy' hit Thailand, I had to help support my younger sister financially because she was still a student. I had to earn more income, so I decided to sell my art work from the trunk of my car as a sideline. I made more than 20 pieces to begin with. The result was extremely good and I was able to sell all the pieces. I was very happy. "That was the start of my idea to create handmade jewelry. Every time I crafted a collection and people loved it, I felt very glad. This was also the first time I realized I could actually support myself and my family by doing something I love to do. In 2006, I decided to quit my job and work full time crafting handmade jewelry. "Nature inspires most of my designs. I love the simplicity and colors of nature, whether seen in flowers, leaves, butterflies, birds and the sky at different times. Everything fits perfectly and it always makes us happy. "Instead of sketching a new design, I simply make it, as I feel that I can visualize it in reality and in all dimensions. If it's not perfect, I do it again. "I am so lucky that I can do what I love. It brings me a living and will never be boring. I can concentrate on my work every time I touch it. "I would like to thank my parents who gave me strong artistic genes. They made me to be filled with the energy of an artist and have my own character at its best."